Mexico! Costa Rica! Fiji! The Bahamas! Canada! (Really.) The best places to buy now -- at prices that are out of this world. I had a windfall of $6,000 in 1989 -- not enough for a down payment on anything feasible in L.A.'s never-ending property market bubble -- but still a nice chunk of change. I could have spent it on a (used) car or one big night at Scores, but instead I got smart: I bought a sweet little plot of land in Mexico, high on a hill overlooking San Miguel de Allende. Now I spend about three months a year there, usually in the rainy season, when the bike trails out in the campo are dust-free, hard-packed, and flanked by towering corn. I own three mountain bikes and two surfboards -- and that little second home of mine has tripled in value. But I didn't do it to make a profit; I did it for the sense of freedom it gives me. It was the same with my friend Jon Lee. While on a vacation last summer in the Mexican state of Nayarit (about an hour north of Puerto Vallarta) he spotted an inexpensive three-acre parcel, half mango orchard, half jungle, bordered by a freshwater stream on one side and a massive, overgrown oil-palm plantation on the other. "I've always had a dream of living somewhere tropical, to be close to the ocean so I could surf and fish and scuba dive," says Lee. A small, pristine cove, dotted with close inshore reefs, is an easy five-minute walk from his new place. "Now I want to explore the coast of Mexico in a boat, to catch my own fish and look for new surfing spots. It's not like the Caribbean or Hawaii -- more like the Southern California coast 50 or 60 years ago, only much warmer." Mexico is a popular choice, but it sure isn't the only one. Canada to Costa Rica, the Bahamas to Belize, Fiji to Prince Edward Island, the possibilities are endless: surf to snow, tropical Caribbean coves ringed by coconut palms to mountaintop retreats surrounded by virgin powder. The best part? Buying abroad is affordable. For less than the cost of a new Lexus you can own a plot of land on Eleuthera or a chunk of Costa Rica's Osa Peninsula. One of these pieces of paradise could be just the piece your life has been missing. Though they start just 60 miles off the Florida coast, the Bahamas feel as far away and exotic as the South Seas. More than 700 islands and some 2,400 smaller cays (pronounced "keys") float in the world's clearest water, drawing sailors, sun-worshippers, sport fishermen, and scuba divers from around the world. Sure, there's the occasional hurricane, but it's impossible not to like a country with no income tax, where the cuisine is Caribbean, the legal system is English, and the cable programming is American. Surrounding it all is the glorious ocean, virtually pollution-free, swept round the clock by the Gulf Stream. Only 310,000 people live in the Bahamas -- and 200,000 of them are all on one island, New Providence, home to the capital, Nassau -- so that leaves plenty of room for the rest of us. "The best part is the solitude," says J.C. Green, a management consultant who bought 145-acre Clove Cay, northeast of Great Exuma, about eight years ago. "There's no industrial activity, no motors. If you're hungry for lunch you go out and fish for it." WHERE TO LOOK The archipelago may extend for more than 500 miles, but land, like fresh water, is still a limited resource. There are few bargains to be had on the larger and more populated islands, such as New Providence, Grand Bahama, and Abaco, and even the smaller Exuma chain, just southeast of New Providence, has seen a fivefold bump in prices since the Four Seasons and Ritz-Carlton moved in. Savvy investors are looking at neighboring Eleuthera, but for the real deals you have to move to the Out Islands -- including Crooked Island, Cat Island, Long Island, Ragged Island, and the Inaguas. On the bonefishing hot spot Long Island, 1/3-acre parcels are going for as little as $15,000, 1.5-acre beachfront lots for $175,000. For a little more than twice that, you can score a 10.6-acre beachfront lot complete with a one-bedroom cottage and a boat ramp. Then there's the windfall option: 700 acres of beachfront on Ragged Island for a cool $12.2 mil. Land titles are freehold (that is, owned outright); while you don't need an agent, you'll need a local lawyer to handle the closing and escrow. REALTORS Bahamas Realty (bahamasrealty.bs); Sunshine Real Estate ( sunshine-real-estate.com). To check up on other prospective realtors, go to bahamasrealestateassociation.com. RESOURCES The Bahamas Handbook and Businessman's Annual (Etienne Dupuch Jr. Publications) is a must-read for Bahamas property seekers. The Bahamas Report (thebahamasreport.com) is aimed at people looking to retire to the islands, but also works well for second-home seekers. Francophiles who love the tropics know all about Martinique and Guadeloupe, the landmark islands of the French West Indies (think Provence in the shadow of a windswept volcano). Although nowhere near as well known as the Bahamas, land here is still not cheap. A three-bedroom villa on Martinique can fetch nearly $200,000. Prices for apartments are more reasonable -- $42,000 for a studio. Prices in the north of the island, directly under Mount Pelee, are understandably cheaper. (And beaches in the south are better.) Guadeloupe is even sleepier than its neighbor, and much of the island is given over to nature reserves, but prices are about the same. In the small village of Malendure, on the west coast, modest houses range from $70,000 (inland) to $121,000 (on the ocean). Living costs are similar to those in France -- wine for less than $5 a bottle, baguettes for less than a buck. The Dominican Republic is six times the size of Puerto Rico and yet, possibly because of the neighborhood (Haiti is next door), this half of the island of Hispaniola is off the radar for many Americans. It has boomed as a budget tourist spot, but only recently has it emerged as a second-home possibility for foreigners, thanks largely to forgiving land ownership laws and no real estate taxes on many plots (be careful: tax laws vary depending on the value of the property, its location, and the degree to which it has been developed; anyone planning to sign on the dotted line should employ the services of a good local lawyer). Infrastructure problems remain in some areas, most notably lack of clean water and electricity, and crime and public protests are common. That said, land prices are truly a bargain right now, especially on the north coast where in Sousa a four-bedroom villa is selling for $195,000. Other deals include one-bedroom condos in an American-built complex for around $40,000, a hillside two-bedroom villa on a large lot with ocean views for $120,000. Building costs are about $35 per square foot, and residency requirements are minimal. From historic colonial towns to beachfront Mayan jungle hideaways to hacienda-filled ghost towns, Mexico is an inviting and varied place. Americans flock south of the border to surf the Mexican Pipeline in Oaxaca, bike the Tarahumara trails of the Copper Canyon, or fish for wahoo off Barra de Navidad. Ted McCann, 34, owns a music equipment business in Los Angeles, but from April to October he spends as much time as he can at his retrofitted double-wide trailer on a half-acre of scrub cactus and yucca in front of the legendary Baja surf break Cuatros Casas, 90 minutes south of Ensenada. "I love the waves," he says. "About head-high it's perfect -- a really peaky hollow section on the inside with these amazing tubes." Ted's excellent adventure began three years ago when he bought a partial share of the fishing-surfing compound of four trailers for less than $1,500. "We have a pretty Zen spot here," he says. "Guys are here just to surf, hang out, and have a good time. There are no bars, no established homes. There are a couple of little tiendas where we can get ice and tortillas." David Smith grew up in Hawaii but now lives in Corpus Christi, Texas. A few years ago, while visiting a buddy in Puerto Escondido, in the southern Mexican state of Oaxaca, he got the surf bug again. He and his wife looked for property for five years, finally getting a break when a two-story, 1,100-square-foot house three blocks from the beach came up for sale for $38,000. "We drove over and I climbed up on the roof deck -- now a palapa-like patio -- and saw an incredible view of the ocean and I immediately said, 'I'll take it.'" A great price, sure, and local realtors confirm that deals can be had if you're willing to act fast. Part of the reason it took Smith so long to find anything is because so many properties are available only as presta nombre, technically legal (though inherently risky) "name borrowing" that allows a foreign citizen to get ownership by using a trusted national's name on the deed. Smith settled instead on incorporation, planning a second career of some sort in Mexico. "I can't just surf all the time," he says. We'll see about that. The best deals on land are often former ejido property, community parcels now being legalized for private sale. It's still slightly dicey and requires a well-connected lawyer and a notary to make sure all the papers are in order, but doing your homework will pay off. More Americans have bought land and live in Mexico than in any other country, a fact that should boost confidence. WHERE TO LOOK While Cancún and the colonial towns in the interior get all the press, Mexico's Pacific coast is where the future awaits. The Pacific coastline is twice as long as the Gulf and Caribbean coasts and has a little bit of everything: surfing, big game fishing, scuba diving, boating, biking, hiking. Up north in Baja California Sur, the tiny town of Todos Santos has emerged as the anti-Cabo, a Carmel-like enclave of artists, organic farmers, surfers, and gringos from places like Lake Chapala and San Miguel de Allende, where you'll find lots of land for $10,000 and small homes for under $50,000. Moving south, running from Guaymas in Sonora to Puerto Escondido in Oaxaca, titles are being cleared, and formerly inaccessible ejido land is now for sale. The arrival of a Four Seasons on the once sleepy Punta Mita peninsula has sent land prices skyrocketing, but there are still deals to be had starting just a few miles north, in the state of Nayarit. Get an 11.5-acre island off the port of San Blas for $117,500. In Rincon de Guayabitos, a half-hour from Sayulita's famous surf break, a duplex awaits for $147,000. Big game fishermen flock to Barra de Navidad, in the heart of the Costa Allegre, the "Happy Coast" between Puerto Vallarta and Manzanillo. For a European flavor, consider Puerto Escondido, in Oaxaca, home of the Mexican Pipeline, where you can find everything from lots ($30,000) to new three-bedroom homes ($108,000), and even boutique hotels (10 rooms, pool: $350,000). RESOURCES Live Well in Mexico (Avalon) is the Bible for moving south of the border. For a more general resource, mexico-connect.com has a deep list of more than 10,000 links to all things Mexican, from Arts to Webcams. Costa Rica has been the playground of surfers and ecotourists for decades. And for good reason: We're talking about a country about half the size of Kentucky that boasts rain forests, hot springs, active volcanoes, world-class waves, deep-sea fishing, cool mountains, temperate coasts -- all with a tropical Wild West feel and the best conservationist values in Latin America. There are species of birds and mammals found nowhere else on earth -- it wasn't by accident that scenes in Jurassic Park were filmed here. "Ticos," as Costa Ricans call themselves, believe in the ethic of pura vida (the "pure life"), the unofficial national motto that defines their sense of happiness and tranquillity. It does rain a lot -- 117 inches a year on the central Pacific coast. But you'll remember why you're here in late July and August, when the weather patterns can shift, the skies turn electric blue, and you're hanging in your ecolodge in a pristine cloud forest. You won't be alone: Costa Rica saw a real estate boom in the 1990s and never looked back. Still, it's not too late to get in. Just remember that if it sounds too good to be true, it probably is. Land scams are common, usually perpetrated by people selling land that is not theirs. Incorporating yourself as a business is the way to go, as it gives the foreign buyer much better protection. "Life is sweet," says Tony Testa, a Californian who opened a restaurant while living on the Punta Arenas peninsula on the central Pacific coast. "I would walk out of my house, past the monkeys in my front tree, down the hill to the beach, to a 180-degree ocean view and my restaurant next to the town of Montezuma's waterfall." WHERE TO LOOK The country has been discovered, and prices can feel more California than Costa Rica. The northern coast of the Nicoya Peninsula, for one, has boomed, particularly around the beach resort towns looking out onto the Papagayo Gulf: Playa Ocotal, Playa de Coco, Playa Panama. But as the infrastructure of paved roads, electricity, and running water vanishes, the cost of land drops. Rent a 4WD and head down the peninsula toward the rustic enclave of Montezuma, where lots above the beach begin about $12 a square meter. Head even farther south to the vast, pristine Osa Peninsula, where protected rain forests and even better prices await: 2.2 acres of mountaintop land with a view of the Pacific for $2,000-$3,000; a 50-acre farm for $40,000-$50,000. RESOURCES The Tico Times is online at ticotimes.net, and its book Exploring Costa Rica 2004 is excellent. If Costa Rica feels too far away or too pricey, there are other choices in Central America. Nicaragua is a largely untrodden adventure playground, undiscovered by the crowds scared away by earthquakes, hurricanes, and its war-ravaged past. But set up shop here and you can spend your spare days exploring an active volcano on the island of Ometepe, diving the Corn Islands off the Caribbean coast, and catching waves off the surf town of San Juan del Sur. The 1979-'90 Sandinista government seized millions of acres of property, and even today many land titles remain cloudy. In spite of, and indeed because of, this bad history, over the last few years buyers in search of bargains arrived in droves. Europeans, liberal activists, surfers, backpackers, and entrepreneurs from Costa Rica and Mexico came bearing fistfuls of cash, snatching up grand colonial-era mansions for $20,000 and plots on the Pacific coast for $5,000. Look around the surf town of San Juan del Sur, near Costa Rica, or Granada, one of the most beautiful cities in Latin America. You can still snare a beach shack, complete with fruit trees, for around $90,000, or a two-room house on 3.5 mango- and coconut-tree covered acres for the same amount--the land alone is worth the price. Got a little more cash and the entrepreneurial bug? An eight-bedroom oceanview bed-and-breakfast can be yours for $375,000. Check out your options at Metro-Nica (metro-nica.com) and Viviun (viviun.com). For a Costa Rica-like natural beauty but closer to the U.S., consider Belize, especially in the Macal River Valley, a former hippie hideaway in the cool highlands on the edge of the Chiquibul Forest Reserve. There are Mayan ruins, a well-integrated local gringo community, rare scarlet macaws, and a handful of eco-lodges. Honduras, Guatemala, and El Salvador are the also-rans in Central America -- all have particular problems, especially El Salvador, where violent crime is a real problem, fueled primarily by street gangs who learned the ropes in Los Angeles. Everything from shootouts and assaults to carjackings and kidnappings are depressingly common, both in the cities and the countryside. Throw in the countless unexploded American mines and ordinance left over from the civil war, and El Salvador is far from paradise. Honduras also has a L.A.-trained gang problem, although less so out in the Caribbean, on the Bay Islands, Roatán, Guanaja, and Utila. Roatán is the most developed and tourist-friendly, with beachfront homes available for $150,000 and parcels for as little as $30,000. Honduran law places limits on foreigners owning coastal land, which is why going through a corporation such as Guanaja Reef Club might be preferable. The organization offers full title and has half-acre parcels for $75,000 and villas for under $200,000. Utila, the smallest of the islands, has seen prices quadruple in the last few years, but there are development parcels available for $20,000. The hot spot recently on Utila is Pumpkin Hill. With cradle-to-grave health care, a low international profile, almost universal Internet access, a retirement plan that is secure for the next 75 years, and some of the world's most spectacular scenery, it's easy to see why life looks great under the Maple Leaf. The skiing, mountain biking, sailing, fishing, kayaking, surfing, rollerblading, and hiking are a few reasons British Columbia has been called "Canada's Hawaii" by starry-eyed realtors. But prices here can be Olympian, starting in the mid-six figures. Better to head northeast to the rough-and-tumble sawmill towns such as Pemberton and Squamish for more reasonable prices (apartments can start at $65,000, and single-family homes as low as $85,000). Out in the Gulf Islands, in the strait between Vancouver Island and the mainland, Salt Spring is the big name, but just a few miles north, on Thetis Island, you'll find warmer water and prices for land, food, and building about 35 percent less than in the (American) San Juan Islands, off Seattle. If you're lucky, like Jeff Mendelsohn, you'll find something that fits your personal ethics. Mendelsohn, the head of an environmental paper company in San Francisco, plunked down $2,000 an acre for a third share of a 128-acre former logging property, 24 miles by boat--no roads--from the resort town of Tofino, on the northern part of Vancouver Island's Pacific coast. He's building a small ecoresort: yurts, buildings made of downed lumber, and a micro-hydro-powered electricity grid. The land is close to Hot Springs Cove, where a natural hot spring bubbles out of the ground into a steaming stream, over a waterfall, into a series of pools, and back into the ocean. Besides having amazing kayaking and whale watching, the site is close to one of Vancouver's best secret surfing spots. (He won't say where. "I have to keep it a secret.") "I love the idea of having some land as far away from the rest of the world as possible," says Mendelsohn. "But the best part is it's still fairly close to where I live." If you're on a budget, don't mind a little snow, love seafood, and have a 19th-century mindset, then Atlantic Canada is for you. The cost of living here is up to 50 percent lower than in North America's most expensive urban centers. The place to go: Prince Edward Island, Canada's smallest province (and smaller than some of its national parks). A tiny crescent-shaped clump of land in the Gulf of St. Lawrence, PEI is characterized by a certain insularity, beautiful countryside, and 25 great golf courses, not to mention terrific trails, biking paths, and spectacular vistas of the gulf. A recent bridge went in (after much controversy and local opposition), so one is no longer at the mercy of the daily ferries. But even with the new bridge, it doesn't feel as if it's changed much since the 1908 publication of Anne of Green Gables (which was set at PEI). The island is truly a window on an earlier age -- farmlands given over to potatoes (the main crop), hand-caught lobster, neighbors who can trace their roots back to Loyalists fleeing the American Revolution. If the golf doesn't bring you, the home prices will: a renovated former school house two-bedroom for $C42,000, a lakeside cottage on five acres of land for $C49,000, or a secluded one-acre oceanfront lot in the shadow of the Cape Bear Lighthouse, overlooking the Northumberland Strait and Nova Scotia, $C79,000. If you're really looking to get away from it all, crossing time zones as well as the international date line, then Fiji is for you. There are more than 330 islands in the Fiji group, only a third of them inhabited. The former British colony has had a spate of high-profile problems since it won independence in 1970, most notably a trio of military coups (one as recently as 2000), sparked by a power-sharing conflict between indigenous Fijians and Indo-Fijians. But the last few years have been quiet, and the economy is considered one of the best-developed of the Pacific island countries. Fiji is also one of the only Pacific nations that allow foreigners to buy and hold property. Because of the freehold land possibilities, a number of developers and resort contractors have already invested in Fiji, resulting in some bargains (if you don't mind getting an already-built spec home). A recently built three-bedroom villa with a pool goes for just $75,000. For about twice that amount you can get a hilltop two-story, two-bedroom, two-bath home with a separate, self-contained apartment and a marble-tiled pool. Need one more definition of paradise? There's no past or future tense in the Fijian language. So, You Want to Buy an Island? 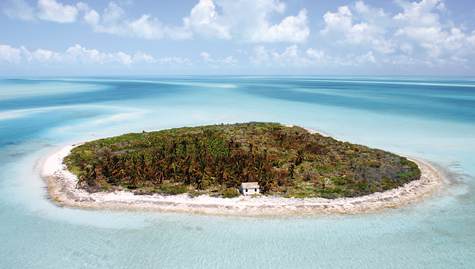 You don't have to be Robinson Crusoe (or even Tom Hanks) to wind up on your own private island. Anyone with a high-speed Internet connection and a small bundle of cash can start the bidding right now -- several thousand personal sandbars with room to build are currently on the market, concentrated in such margarita-worthy hideouts as the Caribbean, Aegean, West Indies, and the underrated Philippines, where $100K will score you not one but two islets surrounded by waist-deep cerulean water (go to privateislandsonline.com or vladi-private-islands.de). Or consider Musha Cay, 85 miles south of Nassau and a steal at $56.5 million. For that you get a private runway, a 10,000-square-foot "main" house, and facilities for 25 guests. One captain of his own isle paradise is 48-year-old software developer Bill Moore. Moore sold his company to Ross Perot in 1996. "I had no debts, no obligations, no kids at home, and money in the bank," he says. "I was ready for a break." So, naturally, he bought an island. He decided on Hatchet Cay -- a six-acre chunk of undeveloped sand and coconut trees 18 miles off the Belize peninsula, 10 minutes from some of the best diving in the world. He built a five-bedroom home with 2,000 square feet of deck. He put in a 120-foot dock, landscaped the place, and installed a reverse-osmosis system that makes fresh water at a gallon a minute from seawater. With the help of the locals, he became entirely self-sufficient. "The fishermen give us fresh seafood, and we give them help if they need to fix their boats or to make a call," he says. "My wife and I eat so much lobster out there it's become a joke. 'Oh, there's nothing in the house. We'll have to have lobster again.'" Hate when that happens. Escape Artist (escapeartist.com) The best place to start researching international possibilities. This site offers first-person accounts, how-tos, property listings, references, country profiles, consumer warnings, and investment suggestions. International Living (internationalliving.com) The website of the magazine of the same name features real estate listings, delirious first-person accounts from home owners, and our favorite part: a home-swapping function. American Citizens Abroad (www.aca.ch) Designed for expats, the site is full of useful information for anyone thinking of buying foreign property. Expat Focus (expatfocus.com) Come here for solid advice before handing over cash for your new digs. Lesson 1: Never sign a contract you do not understand. The State Department Travel and Living Abroad Guide (state.gov/travel) A huge, well-organized hub for nuts-and-bolts information on visas, passports, travel warnings, and other announcements from our friends at the State Department.